Join the discussion on our forums! Come discuss Embrace the Shadow over in our dedicated Embrace the Shadow discussion topic. Turn 8 OTK with Reno Jackson. How many of these would people recommend running along with 2x auchenai soulpriests, 2x darkshire alchemist, 2x circle of healing and 2x flash heal. Is 2 of them too excessive? One of is just fine. You are right, two is excessive. Depending on your deck. If you have Excavated Evil and Holy Nova already in your deck, you won't need the second Embrace the Shadow to deal with board clear. i just fell in love with priest and my velen all over again :D can't wait to blast and flash heal people in the face ! Has anyone realized that that's actually Auchenai Soulpriest in the card's picture? Quite fitting considering what the card does. Also, I really like golden animation. No srsly, that vortex is beautiful purple. 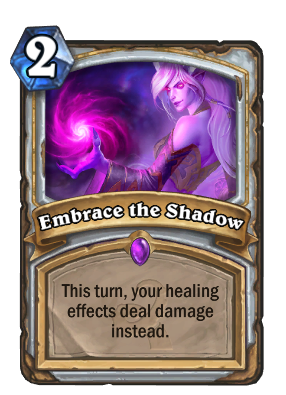 On the current Elise Starseeker Control Priest this card would actually be really legit as 1 of maybe 2, it has a much better synergy with Circle of Healing than Auchenai Soulpriest (a 3/1 is not quite impressive and a health buff would require you to have more cards than just the two you require to do the AoE). It can also threaten about 12-14 Flash Heal burst that Auchenai Soulpriest already does against non warrior match ups. And it can always turn into a legendary with Golden Monkey. It does not quite replace rotating cards but it can help a good deal with consistency on the board clear interactions. Guldan! Make up your mind! I really hope this means that Burst Priest is going to be competitive in Standard. The best part of this card is that it not only can replace Auchenai Soulpriest in some decks, but it can be used along them in certain as well. Want a CoH board wipe? Burn your opponent? Use some minions with healing abilities without being exploited for the entire game? Save your Auchenai for when you can ping stuff later and still drop stuff? Surprise your opponent after losing them? Great synergy with Circle of Healing, better than Auchenai Soulpriest. Also 2Zombie Chow + Baron Rivendare+ Embrance the Shadow + 2Flash Heal + Circle of Healing is 30 damage for 10 mana, making this card usefull in funny decks.